Before we dig into soft credit settings, let’s review what we know about opportunity contact roles (OCRs). An OCR is a role you assign to a contact on a particular opportunity (donation) record. For example, Contact A is a donor on an opportunity, while Contact B is an influencer. You want to capture both of these contacts and their different roles on the opportunity record because both contacts had something to do with the donation. So why did we start a unit on soft credits by talking about contact roles? Contact roles are how soft credits are assigned to contacts and accounts in NPSP. When a user enters an opportunity, they can choose a contact role that will assign soft credit to the donor (like household member). Your users can assign a soft credit manually, which is great for the occasional one-off situation, but many of your users need to assign soft credits regularly for certain types of donations. Fortunately, NPSP can create some soft credits automatically. Let's take a look at these opportunity contact roles and the ways they're used commonly by nonprofits. But you should know before we go any farther: These contact roles are in NPSP if you start a new trial from the Salesforce.org website. If you don't see these roles in your account, you might have to create them yourself. A contact role that assigns soft credit. 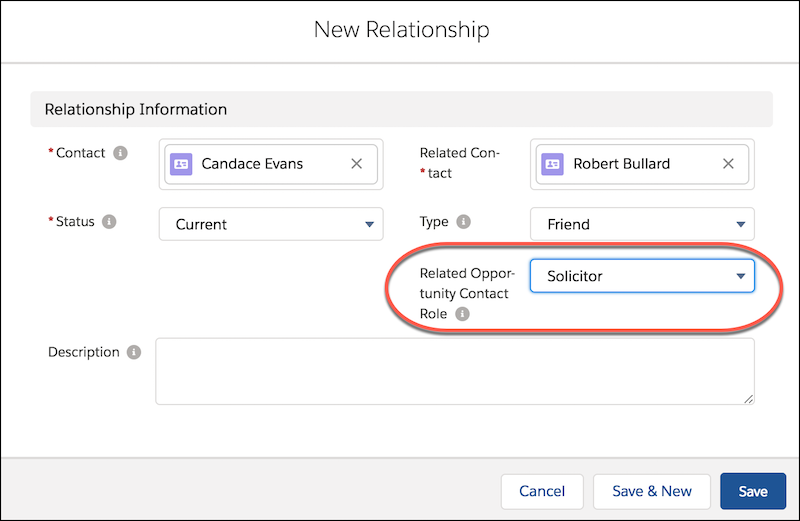 Your users can manually assign this role to a contact on the opportunity record or set up automatic soft credit creation when they set up a relationship or affiliation using this contact role. The default contact role automatically assigned to the primary contact when the opportunity is associated with a household account. When one member of a household makes a donation, all other members of that household automatically get a soft credit. This is enabled by default on the contact roles settings in NPSP. You can exclude a record type from automatic household member contact role creation. The contact role default for matched donors. The default contact role automatically assigned to an opportunity primary contact when the related account is an organization account (e.g. a company or other organization). Can also be assigned manually to any opportunity. While NPSP doesn’t provide “honoree” contact roles out of the box, you can easily configure auto-creation of contact roles for honoree and notification recipient contacts by adding those roles in NPSP Settings. The top three ways listed above are managed through NPSP settings for contact roles. The last two are managed on the specific relationship or affiliation record by the user when they enter the record. So, how does this auto-creation work? Let’s look at a quick example. Our donor Roberto just made a $500 gift to the No More Homelessness nonprofit. 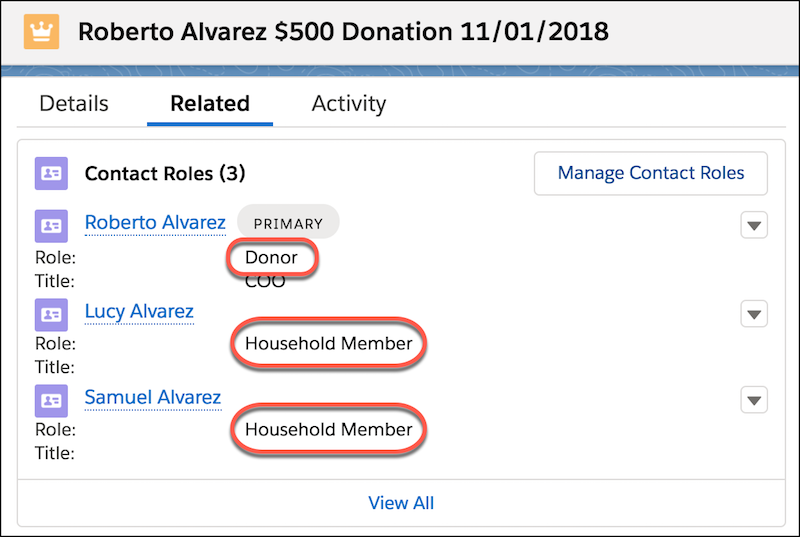 When we enter the opportunity and save, a donor contact role is automatically created for Roberto and a household contact role is created for his household members including Lucy and Samuel. Roberto receives hard credit for the donation while his household members received soft credit. NPSP gives you a good start with opportunity contact roles, but you can create as many custom opportunity contact roles as you want. You might want a contact role for foundation officer, another for office staff, another for alumni parent, and so on. OCRs are completely customizable, and they exist to help you better organize your donors and donations. At the No More Homelessness nonprofit, the development department wants to create a new contact role for program officers to be able to track the particular program office for a particular grant opportunity. Our admin Gorav gets to work creating a new contact role in their org. 1. Click the Setup icon. 2. 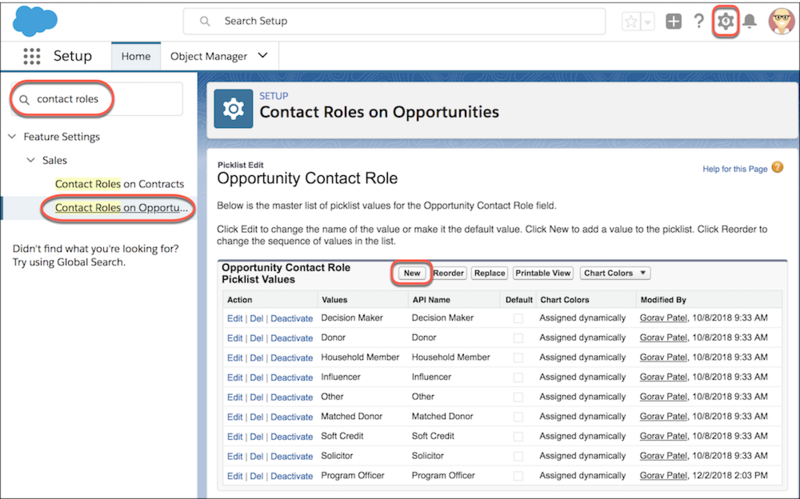 Enter “contact roles” in the setup quick find box. 3. Click Contact Roles on Opportunity. This page is where you can also deactivate contact roles that you don’t need. Keep it simple. If your users won’t use it, remove it! 5. Enter the names of new contact roles, each on a separate line. Now when a grant is awarded, the NMH development team can manually add a contact role to the opportunity for the program officer. That way, NMH has a record of that contact’s specific relationship to that grant. Now let’s take a look at the last two methods for auto-creation of soft credits in NPSP. As mentioned previously, NPSP can automatically create soft credits for individual donations based on relationship records. For example, you can use relationship records to track who the solicitor is for a donor, and NPSP soft credits the solicitor when gifts are made. The relationship (and the assignment of soft credit) is controlled by the user who is creating the relationship. At the No More Homeless nonprofit, their board members have a “give or get” policy where they must give or solicit a certain amount every year to remain a member of the board. The NMH development department wants to be sure their board members get soft credit for all the gifts they have influenced, and it makes sense that they would likely be an influencer on gifts from their friends and family. When the NMH development associate creates a relationship between the board member Robert Bullard and anyone who gives on his behalf (in this case Candace Evans), they choose the “solicitor contact role” in the related opportunity contact role field. 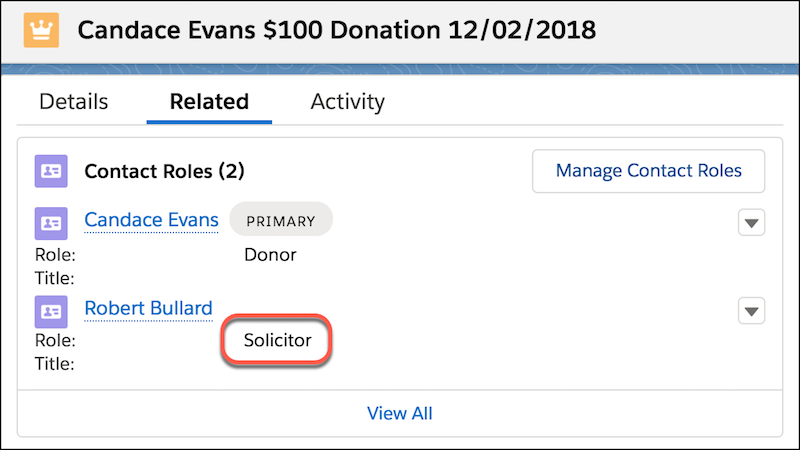 On any future gifts from that same donor, a solicitor contact role is automatically created for her board member and he’ll get soft credit for the donation. When the NMH development assistant creates an opportunity for Candace Evans, NPSP automatically creates a soft credit role for the related contact - Robert Bullard. If it doesn’t apply, they can always delete it, but it helps set an organizational best practice and make data entry that much quicker. If you want NPSP to stop generating automated soft credits for a relationship, remove the value in the related opportunity contact role field on the relationship record and leave it blank. The status field does not affect automated soft credits; soft credits function regardless of a "current" or "former" status field value. 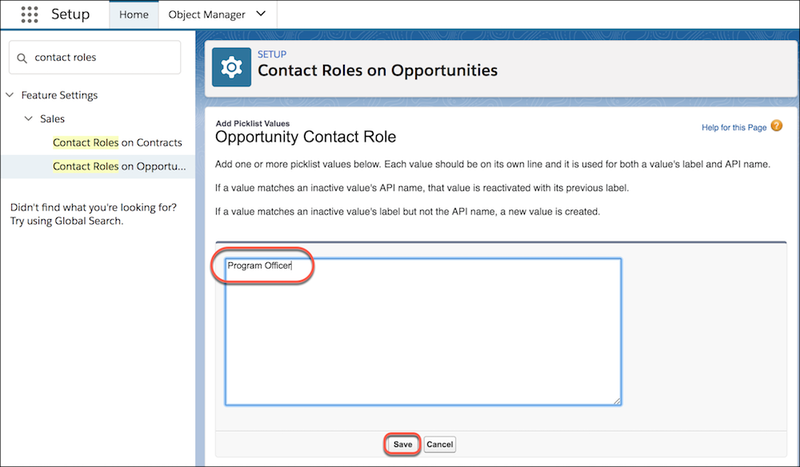 You can use a Salesforce automation tool like Process Builder if you want to update the related opportunity contact role field based on the value of other fields, such as status or other custom fields. NPSP can automatically create soft credits for organizational donations based on affiliation records. For example, perhaps the members of a family foundation want to receive soft credit for every donation made by their family foundation. It works just like relationships, but when you are creating an affiliation record. Since there are many ways to automatically create opportunity contact roles and soft credits in NPSP, you may have situations where more than one automated soft credit rule applies. Fortunately, NPSP applies an order of precedence to avoid creating duplicate contact roles. See the documentation listed in the resources section on NPSP logic for creating opportunity contact roles. Soft credit totals update when the nightly batch jobs run. This means that your users won’t see soft credits totals on the contact or account record immediately after they enter them. This can be confusing for users, so make a point to ensure they’re clear on this point. If one of your teams needs the soft credit rollups to reflect updated totals immediately and can’t wait for the the nightly batch, an admin can manually recalculate on-demand a single account, contact, or the entire batch. 1. Click the NPSP Settings tab. If you don't see the tab in your org, you can find it from the app launcher. 2. Click Bulk Data Processes. 3. Click Rollup Donations Batch. The Rollup Donations Batch recalculates all account and contact hard credit and soft credit rollups, as well as all recurring donation rollups. 4. Click Run Batch. The process may take some time, but it's safe to leave the page and come back later to check the result. Recalculating rollups updates the opportunity rollup fields (including the soft credit rollups) on your contact, account, and household records. We’ll take a closer look at all the rollup summary fields in NPSP in the next unit.